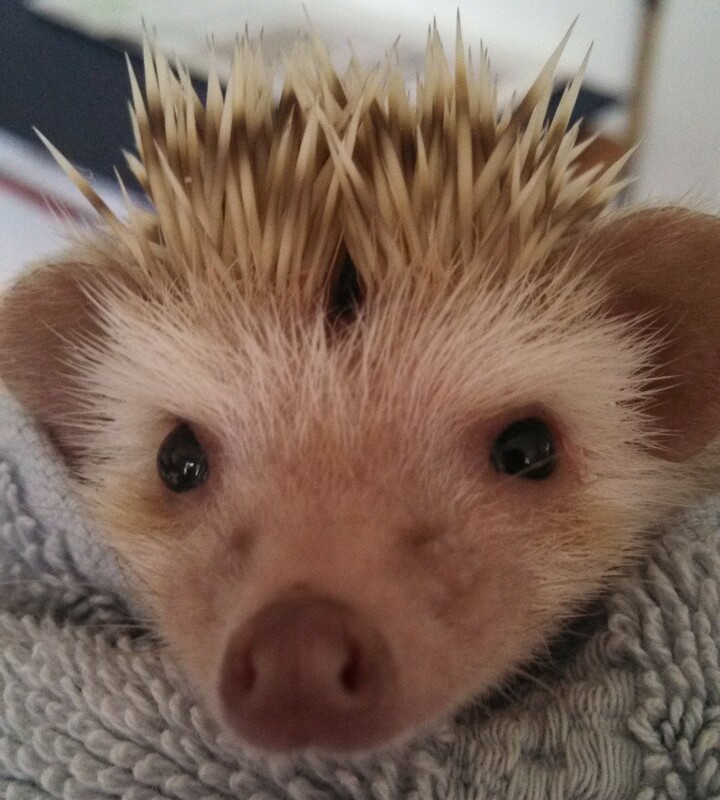 One of the first things I tend to hear when people handle my hedgehogs is an exclamation of surprise at their size. Most people assume that African Hedgehogs should be as large as their European counterparts – some even think that they are their European counterparts and don’t realize the sheer abundance of hedgehog species in the world. Currently, there are believed to be seventeen different species of hedgehog in the world, with only three to my knowledge that are fairly common in the pet trade. That number can easily be reduced to two nowadays, with two of those species having been interbred enough in the United States to qualify as one species. Long-Eared Hedgehogs (specifically the Egyptian Hedgehogs) are popular in the pet trade in Europe but have so far failed to take a hold in the US. They are smaller than African Hedgehogs generally, and easily distinguishable from them due to their enormous ears, pointier face, and fluffier underbellies. Their temperaments tend to be a bit more wild as well, as they’ve spent less time being kept as pets and bred for such purposes. Attempts were made to import them to the United States in the 90s, but failed. Egyptian Hedgehogs carried an illness that quickly decimated the breeders herds and resulted in an import ban for a number of years. Attempts have not been made since to establish them in the United States, breeders focusing instead on the Lesser Hedgehog Tenrec and the Greater Hedgehog Tenrec, of which more will be written in a future post. The African Hedgehog, commonly referred to as the African Pygmy Hedgehog, is what you will find being bred and sold in the United States. These hedgehogs are a crossbreed between the Algerian Hedgehog and the Four-Toed (also called White-Bellied) hedgehog. The two were previously viewed as separate species, but as the years went on the distinguishing marks became more and more difficult to discern so now they are all classed under the African Pygmy Hedgehog title. African Pygmy Hedgehogs are technically just African Hedgehogs. They aren’t diminished in size from an earlier, larger population. They are just the size they need to be. I prefer calling them African Hedgehogs for that reason, but the term African Pygmy Hedgehog (APH or Pog) has caught on in most exotic animal circles. African Hedgehogs are small in size, their weights generally ranging from 250g to 600g, with the odd outlier topping 1,000g. They tend to be a pleasant round shape, like most hedgehogs , with a fluffy white underbelly and four toes on each dainty paw. I have heard them described as potatoes with toothpicks stuck in their back. This is not an inaccurate description. All hedgehogs are insectivores, and require a particular breakdown of fat, crude protein, and carbohydrates in their diet. This nutritional breakdown is generally achieved by feeding hedgehogs a base diet of cat food with occasional crickets, mealworms, superworms, or waxworms (which lack the chitinous shell) as supplemental food. Depending upon the hedgehog you can occasionally give them fruit, veggie, or baby food as a sometimes treat. Too often with sugary foods and teeth problems will develop. They are vigorous animals and require a wheel in their cage so that they can spend the night running as they would in the wild foraging for food. They can run the equivalent of a human running 3 marathons in a single night, and their maximum speed is 5mph. Quite impressive for something so small! They are curious, solitary, generally benevolent creatures in spite of their stereotyping as grumpy animals. With the right care they can become a loving pet for the five to seven years of their life. Which leads us to the next section – Is a Hedgehog the Right Pet For You?